When inserted between the eyepiece and telescope, this premium 3x Barlow lens triples the magnification of all your 1.25” eyepieces. This is a perfect accessory for owners of short, fast telescopes, and is especially helpful for boosting the magnification during lunar or planetary observations under good seeing conditions. The apochromatic, fully multi-coated optics offer great color correction and contrast. The black anodized housing with orange highlights matches the eyepieces in the Celestron X-Cel LX line. A centralized rubber grip helps to keep your hands securely on the barrel, even when your fingers are cold or you are wearing gloves. A brass compression ring just inside the top of the X-Cel Barlow grabs your eyepiece gently but firmly when you turn the thumbscrew. Once the thumbscrew has been secured in place, the brass ring keeps your eyepiece in the Barlow instead of relying on the tip of the thumbscrew itself, offering a better and protecting the barrel from scratches. 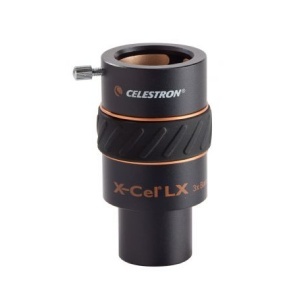 The barrel of the Celestron X-Cel LX 3X Barlow is threaded to accept 1.25” filters, allowing you to change eyepieces without requiring you to remove and re-attach the filter from each eyepiece barrel. Quality X-Cel LX 3x Barlow triples the magnification of any 1.25” eyepiece, perfect for owners of fast, short focal length telescopes. 3-element apochromatic, fully multi-coated optics offer up bright, sharp images with excellent color correction. A rubber grip helps to avoid accidental drops. Barrel is threaded to accept standard 1.25” filters. A brass compression ring holds eyepiece firmly in place.